Managing employee 401k contributions and pre-tax payments for healthcare; administering COBRA, dependent care and college savings plans or simply making certain to offer an employee benefits when he/she becomes eligible all result in mountains of paperwork. It also leaves room for significant human errors in inputting figures or timing mistakes that can be costly to both the employee and the company when manual processes are used. Why risk it when you can easily integrate Benefits Administration as part of your workforce management solution? 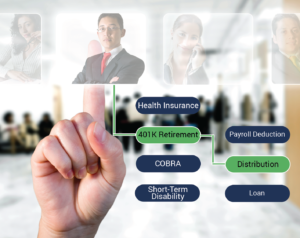 Our Benefits Administration modules works directly with our workforce management solution to provide employees with the ability to indicate pre-tax contributions through employee self service, initiate workflows for benefit offerings upon reaching eligible status and maintain all related paperwork including employees opting out of coverage. All data and documentation is stored directly in the system as part of an employee’s record and a historical record of any changes is maintained for future reference as needed. Benefits Administration ensures that benefits truly can be a benefit for everyone.